The Custard TV: Misfits to return for fifth and final series. 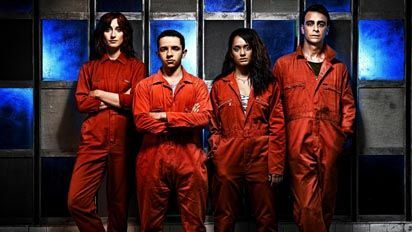 Misfits to return for fifth and final series. Misfits creator Howard Overman, Clerkenwell Films and E4 today announced that Rudy (Joseph Gilgun), Jess (Karla Crome), Finn (Nathan McMullen), Alex (Matt Stokoe) and Abby (Natasha O’Keeffe) will sign on for community service one last time in the fifth and final run of the award-winning series – to air on E4 in autumn 2013. All good things must come to an end. It’s tough. We know. But that’s life. We have to deal with it and so do you. But guys, we can help each other, we can talk about our feelings of impending loss and sadness, like you know, a support group. In fact, there’s an idea…. The new 8 x 60 min series will be produced by Clerkenwell Films (Afterlife, Persuasion) for transmission on E4 in autumn 2013. Writer Howard Overman (Misfits, Merlin), and executive producers for Clerkenwell Films Murray Ferguson and Petra Fried all return.